Rude family members contribute to a lack of cold, clean drinking water? Apparently so because ‘Kaytee’ has more than a few issues with her greedy, insensitive, water guzzling family. Ha ha. We have all grabbed a carton of milk or orange juice out of the fridge only to find that it had no weight and no contents. Now a similar heartbreaking event happens with filtered drinking water? What’s this So annoying! Well, lucky for you some folks at Brita must also have lazy family members because Brita does actually make a larger version of its very popular Riviera model. The Riviera holds approximately 64 ounces of filtered drinking water at most which makes it kind of heavy when full so rather make a larger pitcher, Brita decided to make an in-fridge water dispenser called the Brita UltraMax Dispenser capable of holding an additional ten full 8-ounce glasses of cold, refreshing filtered drinking water more than its cousin the Riviera. 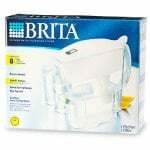 What do these Brita filters remove/reduce? 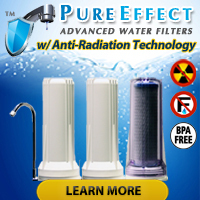 Both the Riviera Pitcher Filter and UltraMax Dispenser use the OB03 Water Filter, a filter certified by the NSF and the Water Quality Association to reduce levels of copper, mercury, cadmium, chlorine, and zinc in drinking water. 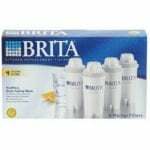 What NSF Standards does the Brita OB03 water filter certify to? A very good question! 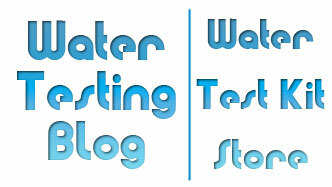 While cruising around the web we found a number of sites claiming that the Brita OB03 water filter does a number of things… that we could NOT verify on the NSF, WQA or Brita web sites. 1) The Brita OB03 water filter has certified to NSF/ANSI Standard Number 53 (Health Effects) for the reduction of Copper, Mercury and Cadmium. 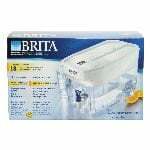 2) The Brita OB03 water filter has certified to NSF/ANSI Standard Number 42 which deals with the reduction of specific aesthetic or non-health-related contaminants (chlorine, taste and odor, and particulates) that may exist in drinking water for the following: Aesthetic chlorine, taste & odor, and zinc. 3) None of the aforementioned web sites mentioned earlier said anything about the OB03 having certifications for its ability to remove or reduce lead or volatile organic compounds (VOC’s).